Woody Ornamentals Archives - Page 2 of 9 - Surfing Hydrangea Nursery, Inc. The increasing size of the white-tailed deer herd on Nantucket has had a huge impact on gardening. These large herbivores seem to much prefer eating our well tended plants over the natural vegetation. It can be devastating to walk into the garden in the morning to find whole groups of plants completely torn to the ground overnight. These large animals sneak in and out of our gardens in the dead of night, like ghosts, often leaving behind only shreds of our prized flowers and veggies. What are we to do? Many gardeners have simply given up. For those that enjoy growing food and flowers for the home, the best bet is a tall, sturdy fence and a dedicated garden. But do we really have to forgo a beautiful landscape with successive seasons of bloom and interest? I don’t think so. Where deer pressure is high, I suggest planting more deer-resistant shrubs and less perennials. Spiraeas are a fantastic way to go. There are many species of Spiraea, but the majority of those cultivated are Spiraea japonica. The top sellers for us are x bumalda ‘Anthony Waterer’, ‘Neon Flash’ and ‘Little Princess’. All three flower in hues of pink and red over a long period in the summer. However, there are a great many other Spiraeas to take advantage of. There are large varieties that will arch over the back of the border, dwarf forms that can be used as ground covers, and a lot of rounded forms that seem to be at home almost anywhere in the landscape. They come in a range of colors from shades of red to clear white and everything in between. With a little planning and strategic maintenance, the clever gardener can have flowers from March until September with this versatile plant. 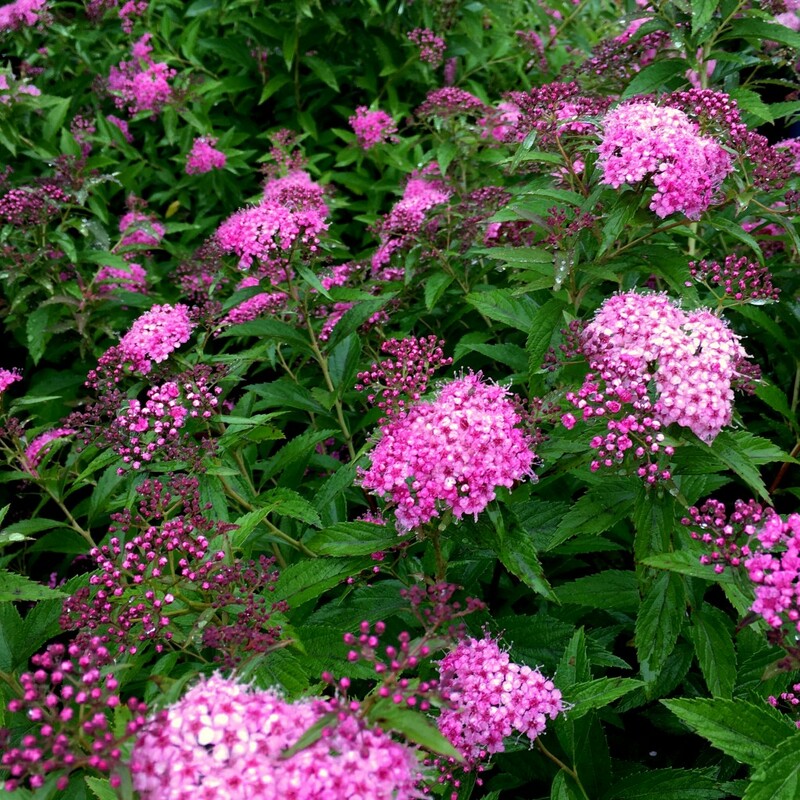 Generally Spiraea prefer a sunny location with average to fertile soil. That being said, they are extremely forgiving. As long as they get a little water during droughts, they will thrive in lean soils with a good layer of organic mulch over their roots. Part sun is just fine for most varieties, although they may tend to stretch a little more than their peers growing in the sun. 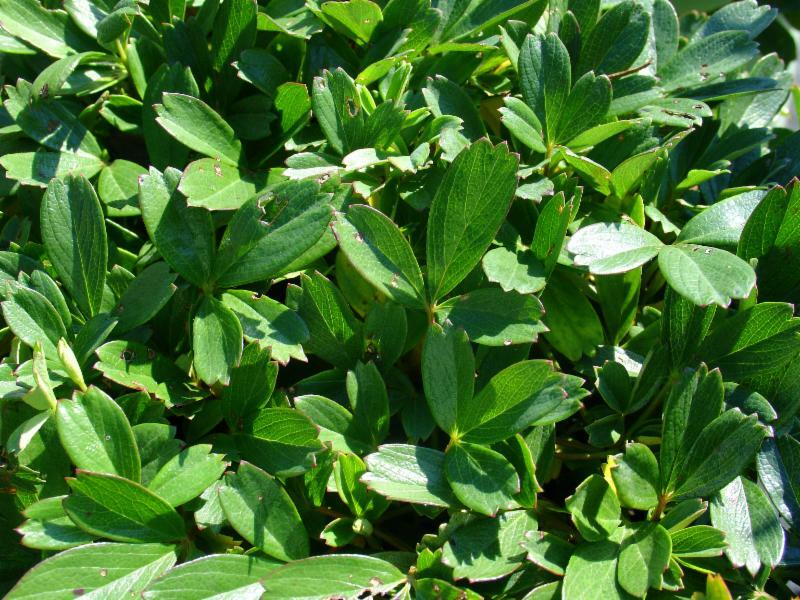 Overall, Spiraeas are pest and disease free, and require more or less the same amount of maintenance than perennials to perform their best. In the nursery, we notice Thunberg’s Ogon Spiraea tends to get powdery mildew early in the season and aphids can be a problem. Consider spraying a fungicide like copper at the first sign of mildew and scouting for aphids while new growth is tender. Insecticidal soap does a great job controlling these little buggers. Bumalda hybrids can get fungal spots when they are packed tightly together with overhead water. We suggest drip tubes for irrigation and a renewal pruning every few years, to keep these plants looking their best. If the spent flowers are a problem, shear them off as the petals fall; this haircut will tidy the plants and promote another bloom cycle five or six weeks later the same season. Early flowering types like ‘Ogon’, Snowmound’, vanhouteii and ‘Tor’ can be pruned while dormant just like their summer flowering cousins, but all the growth removed would have flowered in spring. For the largest flower display, hold off pruning until just after flowers have faded. The ideal way to prune these graceful shrubs is by thinning, rather than shearing. Shearing destroys the natural form and promotes a ‘witches broom’ appearance as many twigs regrow at the ends of trimmed branches. In situations where these plants are used as hedging or topiary, ignore these suggestions; shear the plants into the desired shape while dormant and follow up in early summer with another cut. Spiraea x bumalda ‘Anthony Waterer‘ : This widely planted Spiraea, grows 4-5’ tall and wide with Carmine-pink flowers in summer. New growth is red, changing to bronze and maturing green. This variety is prone to branch sports with variegated leaves. Spiraea Double Play ™ Artist aka Spiraea japonica ‘Galen’: A newer introduction with purple-red foliage in spring, that matures to a bluish green in summer. Low, mounded form 2- 21/2′ tall and wide with rich pink flowers. Spiraea x japonica ‘Gold Mound’: Hybrid between S. j. var. alpina and S. xbumalda ‘Goldflame’. New leaves emerge bright yellow and mature to a light green in summer. Flowers are lavender pink. These Spiraea grow 2.5-3′ tall. Spirea japonica ‘Golden Princess’: The dainty foliage emerges orangy-red, but matures to yellow. Bares pink flowers. Mounded habit, growing to 30″. Spiraea japonica ‘Goldflame‘: New leaves are orangy-red, changing to yellow and mature to light green in summer. Pink flowers. 3′-4’ tall and wide. Spiraea japonica ‘Little Princess’: Small leaves. Pink flowers in summer. This compact form will grow to about 3′ tall and wide. 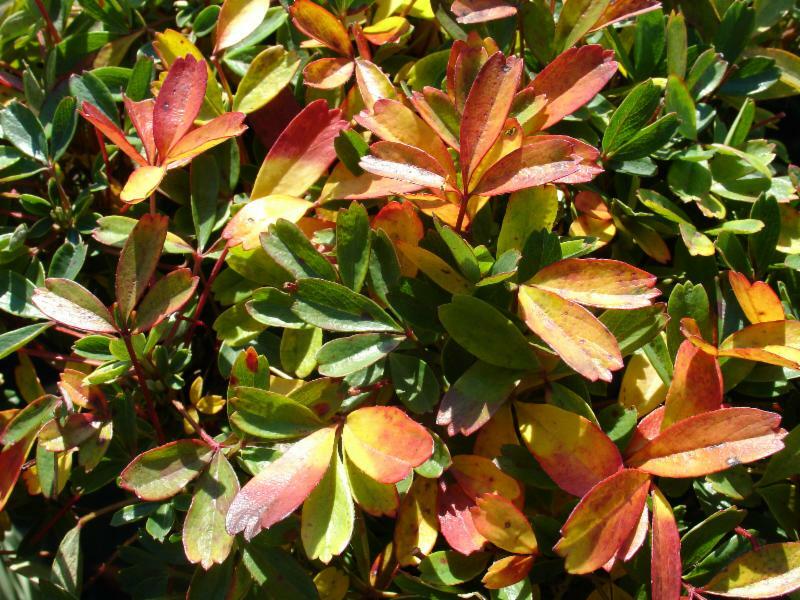 Spiraea Magic Carpet ™: Dirr remarks, “Almost a ground cover variation of ‘Goldflame’.” New leaves are orangy-red, changing to yellow and mature to light green in summer. Pink flowers. Mounded habit, growing to 2.5-3′ tall and wide. Spiraea japonica ‘Neon Flash’: Extremely similar to ‘Anthony Waterer’ but has less branch sports. Carmine pink flowers in summer. Foliage emerges red, changes to bronze and matures green. Rich red flowers on 5′ tall, rounded plants. Spiraea japonica ‘Shirobana’ aka ‘Shibori’: A small shrub growing 2.5-3.5′ tall and wide. Bears pink and white flowers on the same plant. Some plants will display quite a lot of white, while some are mostly pink. Spiraea nipponica ‘Snowmound’: These large arching Spiraea will grow from 5-7′ tall and wide. Blue green foliage is somewhat ovate, with slightly toothed edges. White flowers appear along the branches in late May or June, making the plant look somewhat like a gushing fountain. Dirr claims ‘Snowmound’ is a superior plant to x vanhouteii, another white Spiraea that flowers in early summer. Pruning may be done while the plant is dormant, but all the growth removed would have flowered in early summer. For the largest flower display, hold off pruning until just after flowers have faded. Shearing destroys the natural form and promotes a ‘witches broom’ appearance as many twigs regrow at the ends of trimmed branches. In situations where these plants are used as hedging or topiary, ignore these suggestions; shear the plants into the desired shape while dormant and follow up in early summer with another cut. Spiraea prunifolia: This old favorite is a large rangy plant. The double, white flowers appear in mid April on bare stems. Although there are always a few customers each year that request this plant, we don’t often stock it. Other white-flowered Spiraeas are much better landscape plants. Spiraea thunbergiana ‘Ogon’ aka Mellow Yellow®: I love this plant! 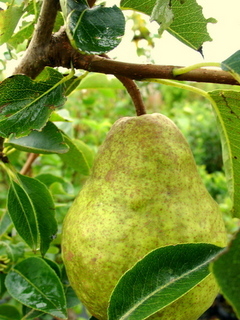 The fine textured foliage is soft yellow maturing to light green. Tiny white flowers appear on bare stems in early spring. This arching shrub gets 3-5′ tall, but is best maintained by periodic pruning at 3′. In the nursery, we notice Thunberg’s Ogon Spiraea tends to get powdery mildew early in the season and aphids can be a problem. Consider spraying a fungicide like copper at the first sign of mildew and scouting for aphids while new growth is tender. Insecticidal soap does a great job controlling these little buggers. Spiraea xvanhouteii: Leaves are bluish green, lobed and wider than ‘Snowmound’ This large shrub grows 6-8′ tall and just as wide. The small white flowers appear in April or early May, along the arching branches. Pruning may be done while the plant is dormant, but all the growth removed would have flowered in early summer. For the largest flower display, hold off pruning until just after flowers have faded. Shearing destroys the natural form and promotes a ‘witches broom’ appearance as many twigs regrow at the ends of trimmed branches. In situations where these plants are used as hedging or topiary, ignore these suggestions; shear the plants into the desired shape while dormant and follow up in early summer with another cut. Spiraea betulifolia ‘Tor’: Leaves are green, wider, and stubbier than many other spiraea, but still slightly lobed and toothed. White flowers Appear in May among the leaves. These plants are compact, 24-36″ tall and wide with a rounded habit. Spiraea betulifolia Glow Girl® : A Proven Winners introduction. Very similar to ‘Tor’ but with yellow foliage. White flowers in May, 24-36″ tall and wide. Rounded Habit. 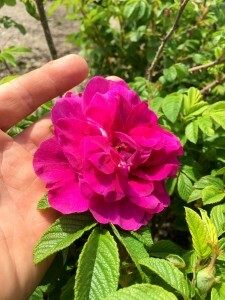 Rosa rugosa is one of Nantucket’s quintessential plants, right up there with blue Hydrangeas. These Asian roses have been grown on Nantucket since the beginning of the last century, and possibly earlier. They do very well in our inhospitable maritime environment. They tolerate salty winds freezing winters and drought, all the while producing loads of flowers and disease-free foliage. They can be found planted all over the island and have naturalized in many of our dunes. The botanical Latin term, “rugosa” means wrinkled. It refers to the quilted look of the shiny green leaves. Rosa rugosa has a beautiful pink single, or sometimes white flower. The white-flowered plants are often labeled as the cultivar, ‘Alba.’ The fragrant, single flowers are very beautiful, but there are many cultivars available with different flowering characteristics. We currently have a large group of ‘Hansa’ in stock. This stunning rose was introduced in 1904, making it more than a century old! 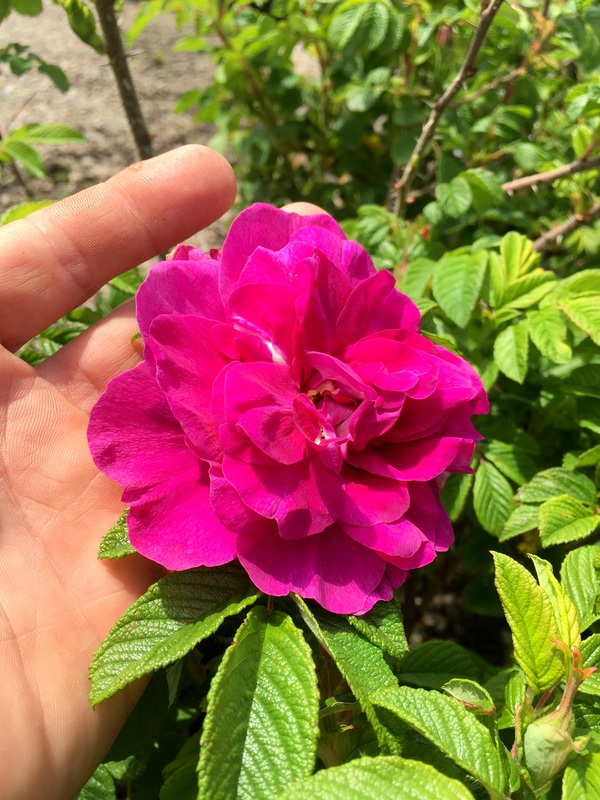 ‘Hansa’ sports huge, fully double flowers in a deep pink color. They flower throughout the summer perfuming the air with a clove-like fragrance. After the flowers fade, their hips enlarge and turn shades of orange and red, making them even more interesting to look at. We sell loads and loads of climbing roses here at Surfing Hydrangea. Happily, antique climbers grown on their own roots are coming back into popularity. 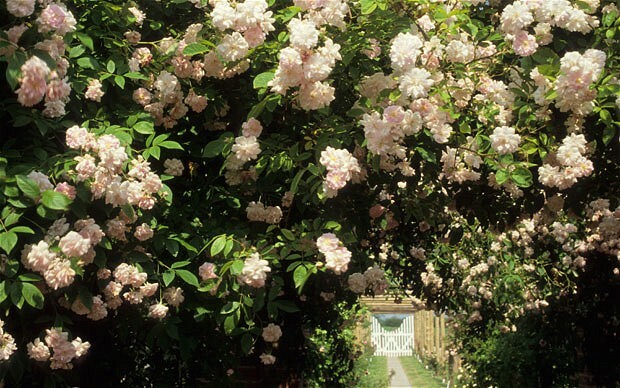 Many of these are rambling roses with long flexible canes that lend well to growing on split rail fences, up into trees and over pergolas. These guys are large, but if planted in the right place and allowed to sprawl, they make a spectacular show in June. We’ve just stocked a group of ‘Paul’s Himalayan Musk’ roses that are sure to please. This variety was introduced around the turn of the century and has been growing strong ever since. This rose is disease resistant and very adaptable – said to bloom heavily with only half day of sun. Although rambling roses only bloom once, they are well worth the wait. ‘Paul’s Himalayan Musk’ covers itself in double pink blossoms that produce an intoxicating scent. A 30′ tall cascading curtain of roses can’t be missed! One of my favorite evergreen shrubs in Japanese plum yew. This elegant evergreen very much resembles it’s namesake. Like Yews (Taxus sps. ), there are several species and forms on the market today. We tend to carry Cephalotaxus harringtonia ‘Prostrata’ for use as a spreading form and Cephalotaxus harringtonia ‘Fastigiata’ for it’s columnar shape. These cultivars are males, and will not bear fruit as many yews do. 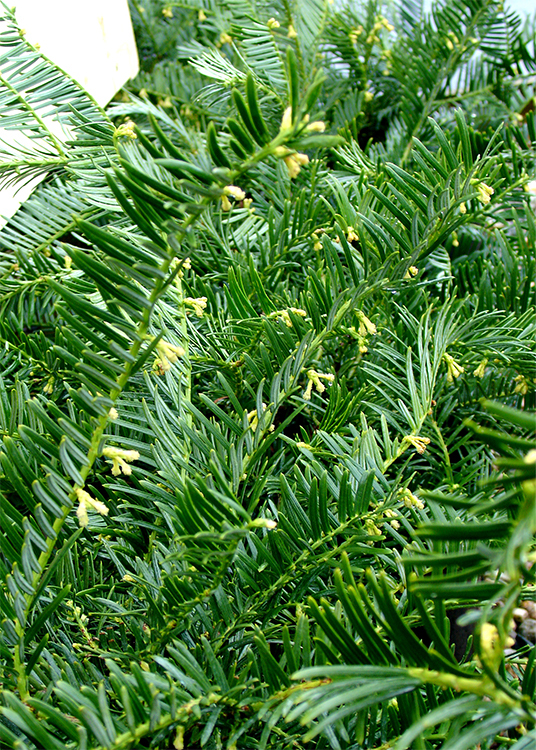 The broad needles are a slightly shiny deep green color and look just like exaggerated yew foliage. The green color persists in winter as long as the plants aren’t in an exposed location. 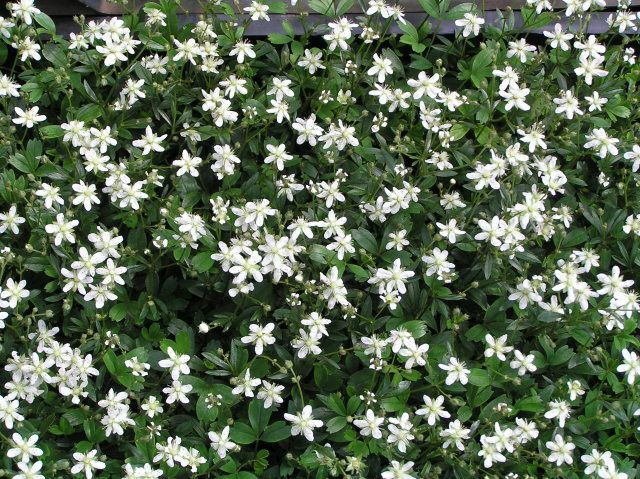 This makes them a nice alternative to boxwood, which can bronze or even turn bright orange in winter. Although we can’t say Japanese plum yew is the answer to all your evergreen desires, it has proved to be very durable and somewhat deer-resistant in one neighborhood in Tom Nevers. This plant will tolerate a number of conditions, but is best grown in shade. It will flourish in moist, well drained soil and, once established, won’t miss a beat during short dry spells. Try pairing the spreading types with plants that have broad, variegated or colored leaves like Hostas. Why not go for the gold and pop in some spring bulbs like Scilla or Snow Drops to bloom in bare areas while the Hostas are still asleep in early spring? The dainty flowers would look great set off by the deep green needles of the Japanese plum yew. The upright form ‘Fastigiata’ makes a superb punctuation in the garden. Plant it next to an entry or a funky container; it would also make a great hedge if well-maintained. We love Hydrangeas here at the nursery, and not just the mop heads. We love them all! My personal favorite species at the moment is Hydrangea paniculata. These beauties bloom reliably year after year, and don’t require complicated pruning to do so. Every year it seems there are more cultivars on the market. In fact, it’s gotten really hard to keep them all straight! A few weeks ago, Anna took the time to compile a list of the panicle Hydrangeas we carry. It’s a good beginning, but we are happy to answer questions in person too. Size: Fast growing to 8 to 12 ft. tall, 6 to 10 ft. wide. 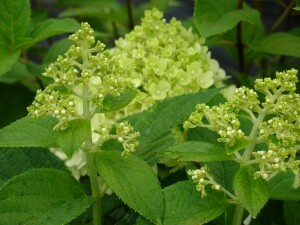 Color: Long-lasting, 10 inch-long white flower clusters in early summer. Rosy-red as they age in late summer and fall. Color: Creamy white flowers in summer, providing a nonstop show until frost. In fall, flowers may turn a pinkish hue. Color: Starts off white but quickly turns to a rose. 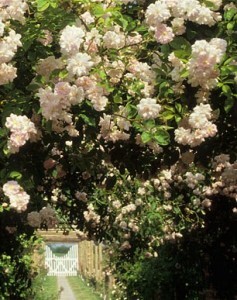 Color: Blooms open creamy white in early summer, turn pink in mid-summer, becoming deep red in fall. Color: Giant white flower heads turning pink with age. Type of Flower: Large, starry blooms. Color: Mid July flowers are white and turn pinkish to almost purple with age. Color: Unique chartreuse blooms in mid-summer that changes to pink in fall. Color: Begins white, turns pink as the summer progresses. Color: Shows white and shades of pink at the same time. Flower Type: Starry like blooms, lace-like qualities. Color: Primarily white, shows shades of pink and ivory. One of the most frustrating problems that befalls Hydrangeas in residential landscapes is leaf spots. In the beginning, a few small spots appear on the leaves. As July turns into August fungal diseases become more and more noticeable. What began as a few purple specks can quickly spread into a pattern of many small or large spots, some even leaving holes in the leaves. A heavy crop of spots can really destroy the ornamental value of a plant. When Hydrangeas are well grown, leaf spots are generally not an issue. Overhead irrigation, warm foggy days, and damp nights favor the spread of these diseases. There are two common fungal leaf spots that affect these plants: Cercospora and Anthracnose. 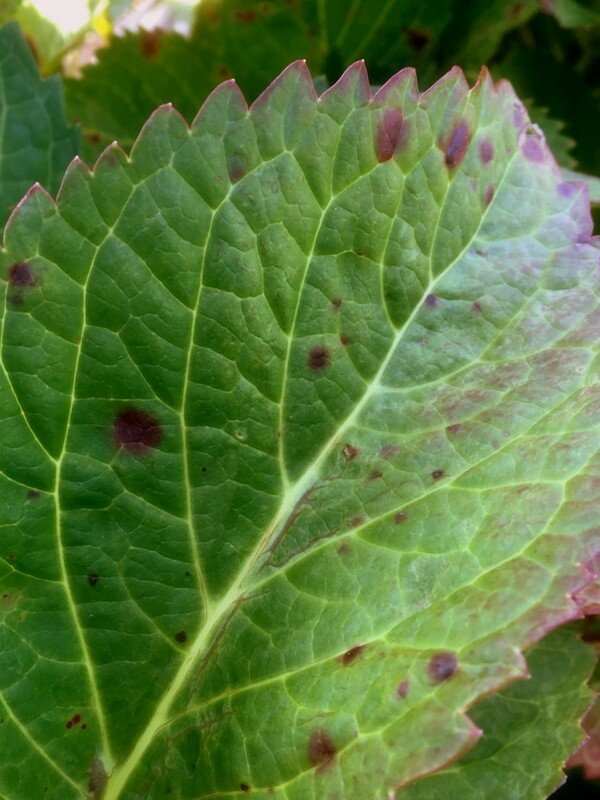 Cercospora Leaf Spot is caused by the fungus Cercospora hydrangeae. These are generally small spots, starting as small purple or tan spots at the base of the plant. As the disease progresses the spots will move up the plants, affecting most of the leaves. By early fall, the spots develop a “frog-eye” look, with a papery-tan center and dark purple halo. Heavily spotted leaves often turn yellow and fall to the ground. These infected leaves serve as inoculum for future infections. Anthracnose Leaf Spot is caused by the fungus Colletotrichum gleosporioides. These spots initially look similar to Cercospora, but can become many times larger, as the fungus radiates out from the initial point of infection. Alternating darker and lighter rings form, giving the spots a distinctive bull’s eye appearance. The rounded spots may become irregular as they contact veins in the leaf. Infected areas of leaf tissue can take on a sunken appearance as well. Unlike Cercospora, Anthracnose often occurs simultaneously on leaves and flowers in both the lower and upper part of the plant. During favorable conditions (temperatures between 75 and 90 degrees F) spores develop in overwintering leaf debris. These spores are primarily spread to the leaves by splashing water during rain events. Bacterial Leaf Spot is also a problem with Hydrangeas. 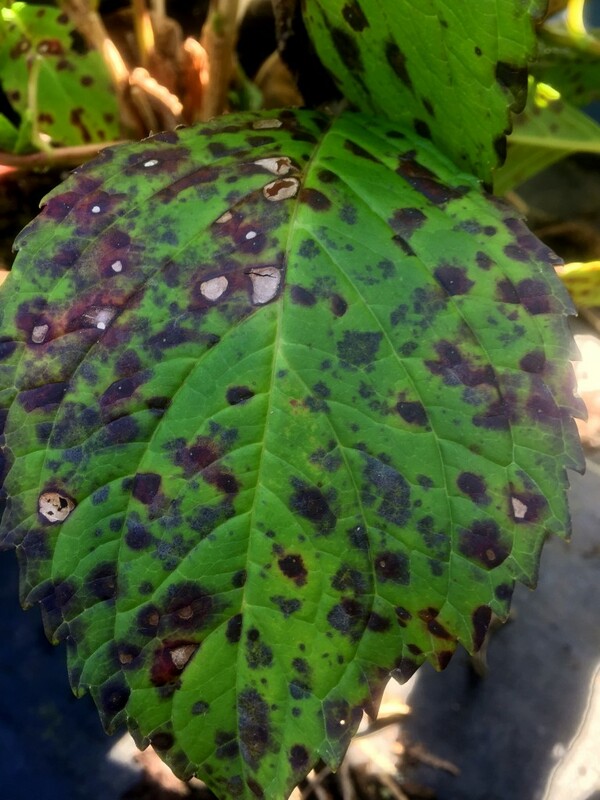 The bacteria Xanthomonas campestris causes spots to appear on infected Hydrangea leaves starting in summer. The bacteria is splashed up onto the leaves from overwintering innoculum in the soil or leaf litter. The bacteria enters the leaves through wounds or the natural openings (stomates and hydathodes). These angular lesions continue to grow and coalesce forming large necrotic patches on the leaves. Treatment for leaf spots of all kinds is generally the same. At the first sign of infection, (or earlier in areas that are historically spotty) begin to spray with a suitable fungicide. Copper-based products are touted to help with bacterial infections as well. Just be careful with copper, some plants are sensitive to it – check the label. The fungicide should help to stop the infection from spreading to new leaves. If the spots haven’t spread throughout the entire plant, consider removing infected leaves. More fungal spores can be released from the spots, if the fungus completes it’s life cycle. Continually remove fallen leaves, and be sure to clean up any leaf material that remains after the frost. Old leaf litter is the primary source for these pathogens. Winter is a harsh time for both people and plants. As we huddle indoors, keeping out of the snow, ice and wind our treasured plants are feeling the full brunt of the weather. Woody plants, in particular, are prone to winter damage because their trunks, branches, stems and buds hang out above ground all year. After a recent storm, I took a drive around town to survey the damage. One of the most obvious problems on that day was splayed privet hedges. As snow blankets the ground and begins to pile up on roofs and roads, it is also collecting on our hedges. An improperly maintained privet hedge is very likely to bow under the weight. Proper pruning is the key to avoiding this problem all together. Keep your hedge healthy: California Privet performs best in full sun, with average, well-drained soil. If a soil test indicates a lack of fertility in the soil, it is wise to apply a fertilizer at the recommended rate. Try not to use privet in shady areas. 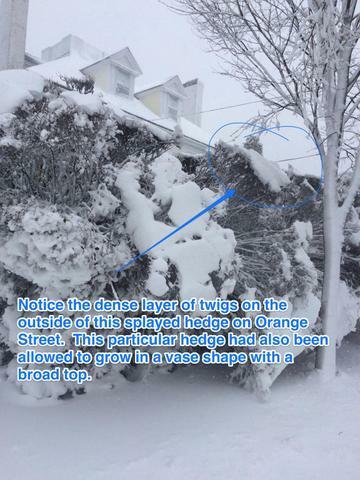 When planted in dense shade (like on the North side of a building) hedges tend to be spindly, with weak growth that is prone to drooping under the weight of snow and ice. If shaded by a large tree, consider having an arborist thin the canopy to let in more light. Give your hedge the proper shape: Professionally maintained hedges will always be narrower at the top than the bottom. This shape helps distribute the weight of the snow evenly, so that top doesn’t bear the full weight, causing it to splay. During the growing season, this shape also allows the maximum amount of sun to reach the bottom of the hedge, keeping it dense all the way to the ground. Whack it back: Every few years, the hedge should be rejuvenated by hard pruning during dormancy. Hedges that are constantly sheared on the same plane begin to form a thick layer of tiny twigs at the outside. This provides a surface for snow and ice to accumulate on. I have seen established hedges cut to the ground that have grown to five feet in one season. But if that scares you, consider splitting the job up into sessions during two consecutive winters. With a pair of sharp, sturdy loppers, cut back the top and one side well below the outer layer of twigs. Don’t be afraid to cut into thick, old wood; Privet plants have hundreds of dormant buds all along their stems – these will break and quickly fill in the area that has been removed. During the second winter, rejuvenate the remaining side. 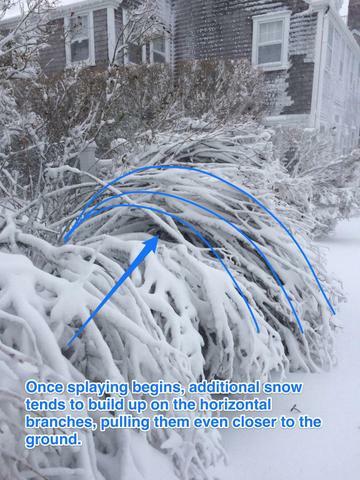 Lighten the Load: If you haven’t been able to get your pruning done, there is no shame in getting out there and shaking or brushing off the snow with a broom once and a while. However, ice is best left to melt naturally; trying to knock it off is likely to cause even more breakage. There are many challenges to living and gardening on an island. Anyone who has lived here for a few years is well aware that keeping your privacy can be one of the greater challenges of island life. Most of us would be lying if we said we have never ducked behind one of the rows at Stop and Shop in the winter to avoid an ex or a particularly chatty neighbor. Now that Stop and Shop is half the size during construction, this problem seems to be all the more frequent! Many of our customers at the nursery are particularly concerned about their privacy at home. There are many plants that do a great job of screening out the neighbor in the form of hedges and hedgerows. But so many of these loose their leaves in the winter, or become a food source for the ever-growing herd of white-tailed deer that roam the island. So what is the private gardener, concerned with year-round privacy to do? Plant deer-resistant evergreen trees, that’s what! And what are some of our favorites? Spruces! 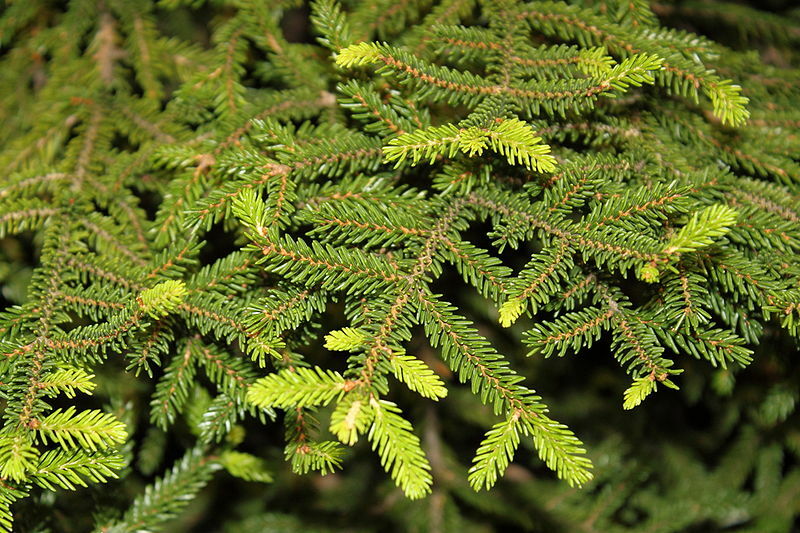 We highly recommend spruces to islanders concerned about screening for many reasons. They grow tall enough to obscure a pool area or back yard from a neighboring second story window. They are adaptable, growing in a wide range of soils and exposures. Many actually prefer sandy, acidic, well-drained soils that are typical on most of the island. We stock a variety of spruce trees, suitable for Nantucket. I highlight a few below, but there are many cultivars available and we are happy to source more obscure varieties for discerning customers. Picea abies: Norway Spruce is native to Northern and Central Europe, but is extremely well suited to the extreme environment in the Northeast. These large trees will reach perhaps 50 or 60 feet tall and 20 or more feet wide in protected or forested areas of the island, away from the seashore. As they mature, they take on a distinctly pyramidal shape, with gracefully arching branches. Their needles are medium green and glossy. Picea glauca: White Spruce is native to North America, and is found from Alaska to Labrador and into the Northern contiguous states. This spruce is known to grow to 60 feet tall with a spread of 10 to 20 feet. 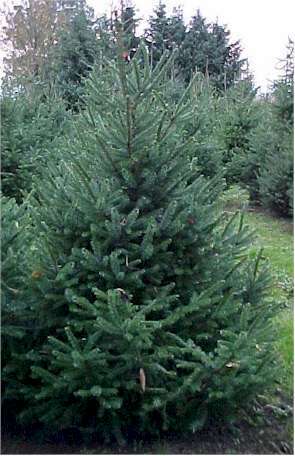 Mature specimens appear more like a spire, than the typical Christmas tree shape they bear in youth. Known to be one of the most adaptable spruces, it is naturally found at stream and lake shoes and the surrounding slopes. The needles are pale green to dusty blue. Picea glauca ‘Conica’, Dwarf Alberta Spruce, belongs to this species; as does Picea glauca ‘Echiniformis’, a dwarf form sometimes referred to as Hedgehog Spruce. 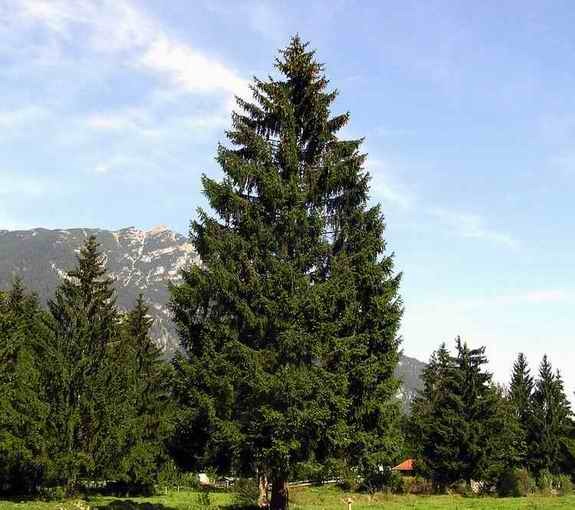 Picea omorika: Serbian Spruce was introduced from Serbia and Bosnia in the 1880’s. This spruce varies somewhat in habit, but is generally matures into a narrow pyramidal shape with graceful ascending branches. Size varies, but I would expect a mature tree to be 50 feet or more tall and twenty feet tall in a protected inland spot. The needles are glossy-green on the top, and glaucous on the bottom giving the tree a lovely blue cast. 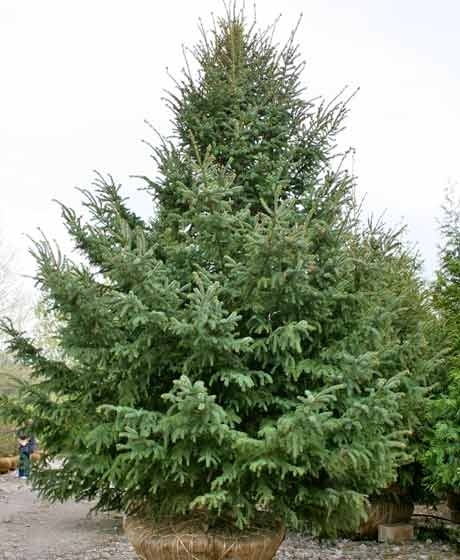 Picea orientalis: Oriental Spruce was introduced to North America in 1827 from the Caucuses in Asia Minor. These slow-growing spruces are expected to mature at 50 or 60 feet in a protected inland area. These trees are densely pyramidal in form with horizontal branches that may become pendulous with age. We LOVE these trees. Their deep green needles are stubby and blunted, almost soft to the touch. 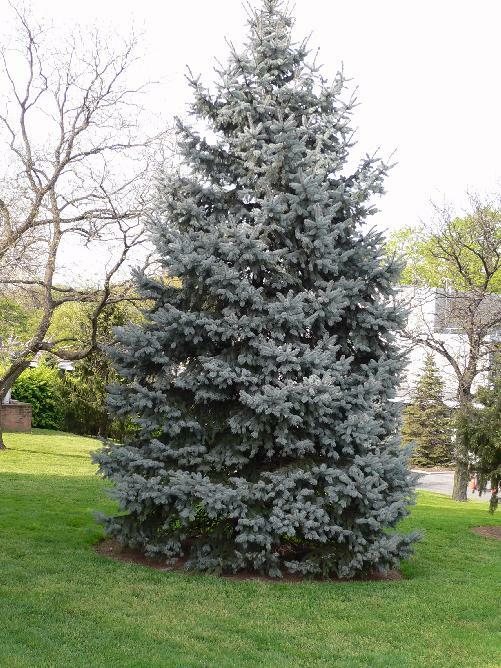 Picea pungens: Colorado Spruce is possibly one of the most common evergreen landscape trees in the suburban Northeast. It is Native to the South Western United States, from the Rockies to New Mexico. Generally known for blue forms such as , ‘Hoopsii’. This is another pyramidal tree, but recognizable by its prickly needles that more or less grow completely around the stem. Full-sized cultivars grow to approximately 60 feet in height where exposure is limited. There are, however, dwarfs in this species that are extremely compact.